During the month of June 2011, Nau-haus Gallery exhibits Hagit Barkai's show Resistance. Barkai has participated in several group shows, but this is her first solo exhibition and it's replete with new and old pieces. 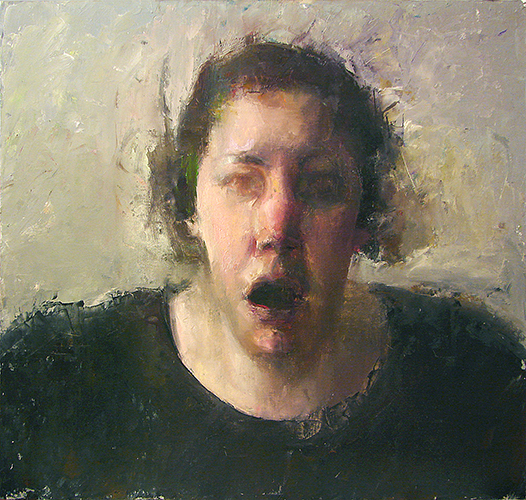 She specializes in a style of portraiture that I characterize as emotional Platonism in that her works communicate not an action or a personality but an emotional ideal. These works, particularly her earlier works, remind me of Lucien Freud or R.B. Kitaj or Eric Fischl, who are often praised for their "psychological penetration" of the subject. Their subjects were often famous people with whom most viewers could have a passing familiarity and make an assessment as to whether the painting captured the subject be it Leigh Bowery or Steve Martin. I don't know the psychological states of the subjects of Barkai. However, I can measure the psychological reaction that they provoke in me. 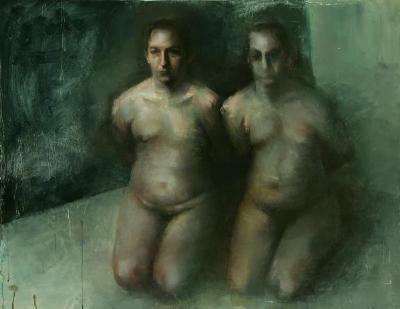 Barkai contorts bodies and facial expressions to match an emotional ideal that runs the gambit of human discomfiture. Barkai's subjects are known only to her and known intimately in that she has a personal relationship with those she paints. In some of her works, she provides enough context in the background or in the title for the viewer to grasp the archetypal scene. Even though the viewer doesn't know the subject, s/he knows the situation and can read it or read into it as s/he sees fit. Two works from her "Home" series that exhibit this characteristic are Aisen and Tyson and Bat Ami. 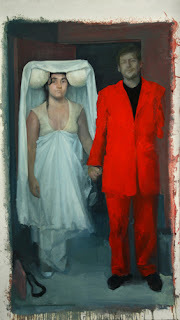 As Robert Boyd pointed out to me, Aisen and Tyson is a wedding portrait that "...seems to deliberately recall that foundational painting of Western bourgeois art history, the Arnolfini Wedding by Jan van Eyck." It's a common trope used to portray the dynamics in a relationship. The groom stands slightly in front of his bride. His arm either reaches back for his bride or pulls her along with him. Her face broadcast a defeated resignation, his a blurred defiance underscored by his brilliant red suit. Their wedding costumes shroud their bodies. Based on positioning, color, and facial expressions, this union doesn't exactly augur ecstasy for either of them, especially Aisen. Another picture painted using this same approach is Bat Ami, which literally means "daughter of a nation." The female subject's clothing hangs on her body, ill-fitting and uncomfortable as if its only purpose is to hide (perhaps shame) or protect (perhaps humility). Her facial expression is one of both discomfiture and the wonder of either alienation or disbelief. The subject doesn't occupy the picture plane. Rather, Barkai thrust her into this setting of existential dread. Another group of works move closer to that emotional ideal. In co-curator Surpik Angelini's essay "The Art of Hagit Barkai: Between the Abject and the Sublime", she observes that Barkai's creative process and thus her work is "rooted in what Heidegger termed 'Dassein' or being in the world". 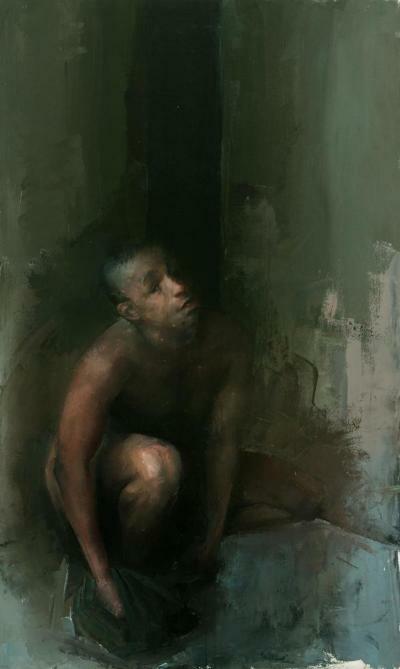 ﻿What I see in these paintings are figures in a world stripped of context. These works are meditations on the body. They are signs for our humanity. Symbols of emotional states. At first glance, they appear to be signifiers with out a signified (references without a reference for those of you not steeped in semiotics or Saussure). The settings are vague and oblique or non-existent. Unlike Francis Bacon or Frichl, the subject is not a famous person like Pope Innocence X or Steve Martin, but private people in unknown (and unknowable) spaces. Thus, these works signify (reference) neither a literal person nor do they transcribe an event. Rather, they illustrate an emotion by forcing you the viewer to match Hagit's signifying image with a complex of emotions that serve as the signified (what is referenced). You see this quality in works like Vomiters (not everywhere) and Blindfolds, which is if not an a priori rendering of dread then it's at least visceral one. ﻿﻿Confronted with human forms in these positions, you the viewer must make sense of them, constructing a context, supplying a narrative. 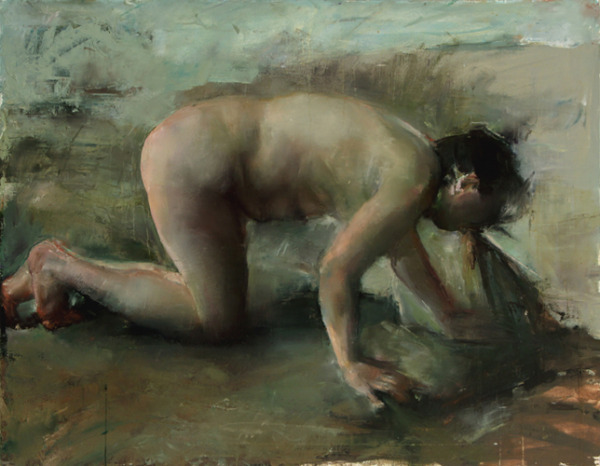 The images are primal not only in their subjects' nakedness and poses, but also in the way that the works are constructed. Barkai slathers and scraps paint across her canvases, grating, tearing, bruising, smearing the materials and the images that they compose. Her leaden, earthy palate further facilitates the feeling of too, too solid flesh. The hues of the figures exude not death but an awareness of mortality, the gravity of bodies, the weight of vulnerability. And yet, you could consider none of this (from semiotics to the mechanics of painting), understand none of this, see one of Hagit's paintings and "feel" exactly what these works are about. I dare you to meditate on these pictures for a minute and successfully resist the impulse to understand, to explain, to feel these pictures. If a universal language of vulnerablity, unease, disquiet exists, Hagit has discovered it. As always, Dan Allison and the Nau-haus staff do an excellent job of supporting their artists. On the Nau-haus webpage dedicated to Resistance, Allison has posted the artist's statement and CV, written his own review, and published the essay, "The Art of Hagit Barkai: Between the Abject and the Sublime" by Surpik Angelini. Nau-haus has also compiled a catalog of the show that can purchased online. My only criticism of the gallery is the burden of plenty. I'd have liked a little more space between the works, but when that's my only complaint, I realize just how good the show is. From the photos above I was reminded of the paintings of Odd Nerdrum, actually.